There have been a large number of terrorist incidents in the last couple of years, which are best punctuated by the parliament hill shootings in october 22 of 2014. Why? Because thats when the liberals really started to go into denial about the conflict in their belief systems, and just how tightly wedged they are between a rock and a hard place. Since that time, we have been entreated to an escalating number of insults from the islamic world: We've had the sydney hostage crisis, the charlie hebdo shootings, the chattanooga shootings, the paris attack, the san bernandino shootings, the brussels attack... And most ironically now, the shooting in orlando which killed large numbers of gays. Well publicised terrorist attacks on western nations, all perpetrated by a group of people who hate the things that liberals claim to stand for. So what has been the response from our leftist friends? They have stuck their heads in the sand to an overwhelming degree, and denied that there was any link between the terrorists and islam. 'Don't let a few crazys tar the reputation of an entire community!' The liberals shouted, even though they had done just that whenever shootings were perpetrated by conservatives. The level of cognitive dissonance on display here is staggering. Among two species of birds that aren't even closely related, there exists a strange and parasitic relationship. 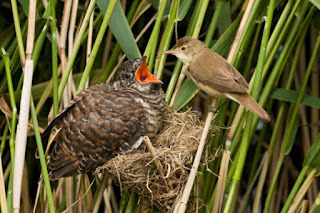 The common cuckoo has a breeding strategy that involves laying its eggs in the nest of reed warblers, and bullying them into raising their altricial chicks. Intimidation is the word of choice here, because any reed warbler which refuses to tow the line will either be attacked or have its nest torn down. Rather than throw the obviously foreign egg out of its nest (and engender the wrath of its parents), the reed warbler cares for the egg like it was its own. 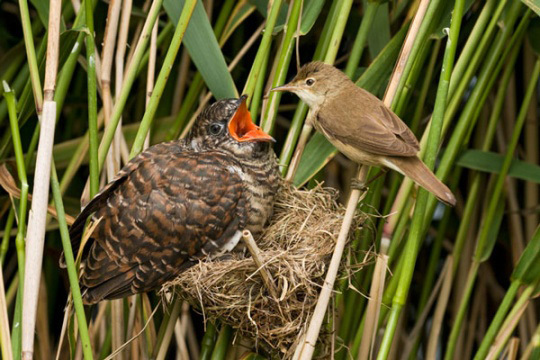 When the cuckoo chick hatches, it proceeds to toss all the other eggs from the nest, while the reed warbler stands by impotently. With just a single chick to look after, it now works tirelessly to nurture the cuckoo, even though it is of a different species. The similaritys this has between liberals and muslims is breath-taking. Muslims plant their egg (sharia law) into the liberal nest, and when the egg hatchs, it pushs all the other eggs (I.E, liberal values) out of the nest. Rather than destroying the intruder on sight, the liberal will pretend that nothing is amiss. Because tolerance and diversity is all the rage, dontchaknow. The majority of terrorist attacks on American soil in the past 15 years have been committed by white men.